This article takes a deep look at the Applicative Type Class using the example of the List class. 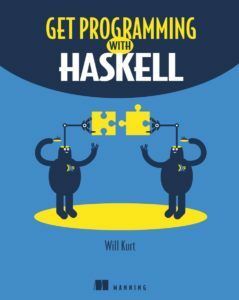 Save 37% on Get Programming with Haskell. Just enter code fcckurt into the discount code box at checkout at manning.com. The List type, being a fundamental example of nearly everything in Haskell, is both a container and a context. List as a container is easy to understand. A list is a chain of buckets of whatever type of data you want to hold. List is a member of Applicative and there has to be a way to view list as a context. The list data structure doesn’t give us enough information to say what this means. To understand how we add two values in a list we need some extra context to interrupt the general idea of applying a binary function to values in lists. Adding together two Ints in the context of a List means adding all possible combinations of the values in those lists. A list as a container is a sequence of values that holds any type. Each item in the list points to the next one or to the empty list. A list as a context represents a set of possibilities. Think of a list as a context as being a single variable that can contains many possible values. Don’t be fooled by your familiarity with list as a container. Both Maybe and IO are much simpler contexts to reason about. A Maybe Int is a single Int value in the context that it may be missing. An IO Int is an Int value in the context that it was produced by some IO action that may have produced side-effects or other issues. A [Int] is an Int in the context that there are potentially many possible values for that Int. 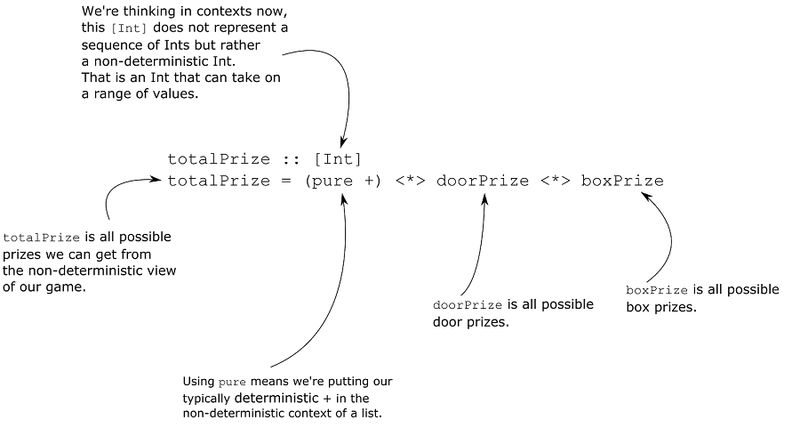 Because there are many possible values that [Int] could have, when we apply a function (Int -> Int -> Int) in the context of a list we must think non-deterministically and compute all possible results of that operation. Figure 1 Lists as non-deterministic computing are hard because we normally think deterministically. 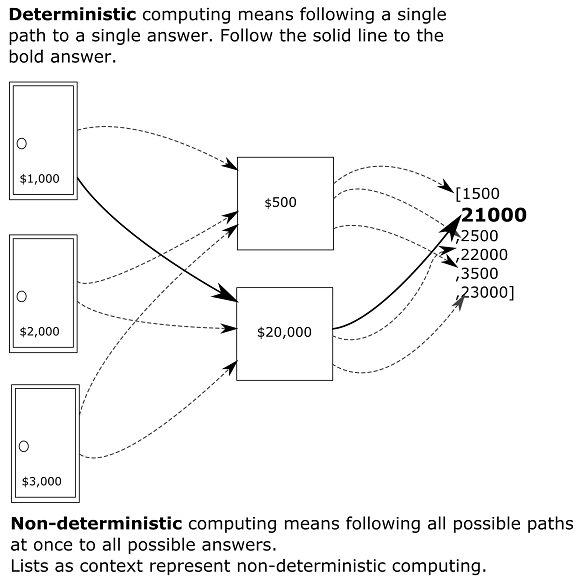 Figure 2 non-deterministic computing computes on all possible paths, rather than one. In GHCi we can see that totalPrize represents all possible prizes that can be won. When we add two lists in context we get the combination of all possible worlds. For each door prize, we can pick one the two possible box prizes. The results of adding two lists within the context of a list are all possible solutions in our non-deterministic world. Next, we’ll look at two more examples of practical non-deterministic computing. We’ll use non-deterministic computing to compute all non-prime numbers allowing us to easily identify primes. Then we’ll used non-deterministic computing to quickly generate a set of possible test data. A prime number is any number divisible by only one and itself. Suppose we wanted to generate a list of prime numbers. An amazingly simple method for computing a list of primes exists using the Applicative properties of a list. Here’s the basic process. If you ever need to whip up a quick prime number generator, this little trick can be a useful tool to have. We already know that we can use Applicative to create instances of User in the context of both IO and Maybe. To demonstrate how powerful the list context is, we’ll do the same thing, only to create a large amount of test data. What we want is to generate some test data that includes all possible combinations of these values. This means non-deterministically computing a list of possible users. We could do that by hand but that’d mean writing out 4 x 3 x 3 = 36 entries! Plus, if we later decide to add another value to any of those lists it means a lot of work for us. Using the List type to perform non-deterministic computing shows how powerful the Applicative types class can be when working with contexts! Add your own name to the testNames and regenerate the data. How many examples are there now? You and your roommate each had two beers last night. You’re having either two or three friends over tonight, depending on who can come. For a long night of gaming you expect the average person to drink three to four beers. Hopefully, you found this article informative and interesting. For more on Haskell, check out the book on liveBook here and see this Slideshare presentation.